Do you plan to improve your home’s water, wastewater or gas heating system? Whole house Santa Clara copper repipe helps streamline and modernize residential and business pipes. Ask the Gladiator Repiping team for their expertise when replacing all the pipes in your home. Call us at 408-649-7290 today for a free estimate. Or stop by our storefront location at 541 W Capitol Expy Ste 10-223, San Jose, CA to speak with one of our skilled team members. We offer experienced whole house repiping to our community of Santa Clara. We usually complete an entire repiping project for homeowners (including inspections) within four days. We hope you choose our company as your preferred Santa Clara repipe firm. We’ll replace all the old pipes inside your home with new, modern ones. Our Repiping specialists have the required care and skill to perform any piping job, no matter the size. Our team of repipe specialists in Santa Clara works quickly and efficiently. We remove old pipe, install new pipe, and (after inspection) repair the drywall again. We leave your drywall in paintable condition. We Offer Reliable Copper Repipe in Santa Clara! Did you know we also work as skilled Santa Clara copper repipe plumbers? Long lasting and beautiful, copper pipe appeals too many home buyers. Although more expensive than standard pipes, this metal pipe will last a long time. It won’t break or corrode easily. 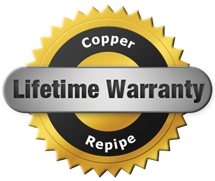 Ask us to completely repipe your home using attractive copper pipes! If you seek Santa Clara copper repipe plumbers, Gladiator Repipe offers fast, skilled service. We make customer satisfaction our top priority. We offer experienced copper repipe in Santa Clara. You’ll love the way your home’s gas, water, and wastewater pipes work after we perform repiping. Call us now at 408-649-7290. We’ll provide a FREE estimate upon request. We look forward to helping you!